Who doesn’t want to make progress in the shortest possible time? We developed an exclusive coaching method which is done by using video images. You are clustered with a maximum of 3 riders and accompanied by experienced instructors who are former BSB, World SBK and MotoGP riders. The instructors have a camera installed on their bikes and are filming you from every possible angle during your laps. As a result, we will be able to make a corner analysis with the video footage so you´ll see what is your driving line on the circuit. We also pay attention to the physical and fitness aspects of track driving; a good physical shape of the body enforces the concentration of the mind! Our instructors ride the all new Ducati Panigale V4 S and 959 Corse. But you can also make a test ride on the track for free on these Ducatis! The price per day is 175 euro; this does not include the registration fee. All the video footages will be downloadable at our website. 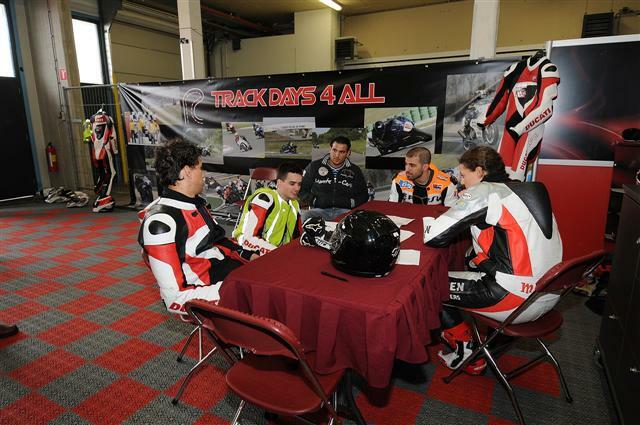 Click for more information about our track days with personal coaching. Want to see more…… click on the movie below (the film is in Dutch but all our instructors speak fluent English).